mint wagon!!! did it use b on walky rims?? n up round st agnes way?? n is that aerotech interior in th red one?? The wagon used to be on VT SS wheels. He did used to visit a friend on Tolley road in St Agnes back in about 2004-05. The front seats in the red one are Recaros. hows the old school no holes intercooler setup. Supra cooler, custom no holes piping. Years ago this would have been the ****! Happy ive pulled it off then! What kit did to buy Todd? Or getting custom made? Haven't bought one yet. You still have that jd customs for sale? A few years ago.. now it's mostly xr6t's like that orange 'juiced' thing, r33's and faggy old evos every weekend..
Yeah seen that r35 gtr running a FG GT 355kw thing and an evo 9 or something. 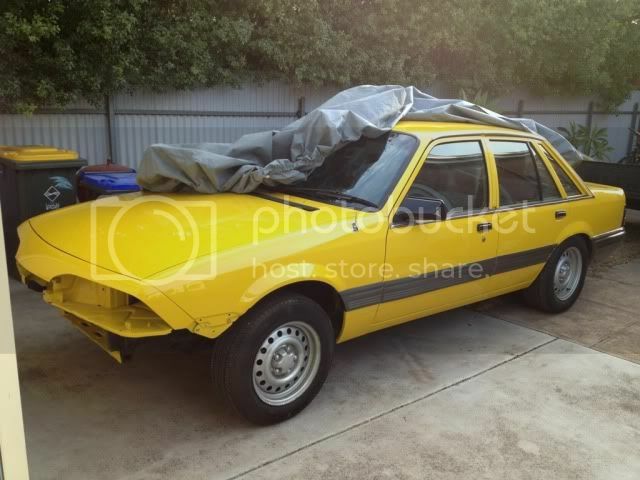 Got my car back from the painter on the weekend! Mmmm, looks like a bought one lol. Come up a treat! looks good apart from being yellow... kidding mate come up good! Wow I want that paint!!! Last edited by Steff; 14-05-13 at 16:11. F*cking mint lockie. Nice work. Looking forward to seeing the build progress! Last edited by Jet R31; 28-04-13 at 21:09. Take the plastic NEO cover off and run 9s. Looks standard! Mint work God.